The Adventures of Tioga and George: Still In Missoula Montana! As you may have guessed from reading this Blog post title, we remain in Missoula Montana. We are having a fabulous time fixing stuff! So we are staying here doing fixing! Here is the thing! We love fixing, cleaning, straightening, making things work better, finding more efficient ways to do our daily chores. I guess that you must know, that the Scampy Team is a bunch of tweakers! And being that we are tweakers, we tweak! "Tweak means to adjust or fine-tune". Note: I understand that a tweaker is defined as a person who uses stimulants, most commonly methamphetamine and amphetamine. That's not me. I have never used any drug. Although in the early 1970s I did grow marijuana as a kind of nerdy backyard garden experiment to grow sinsemilla. Also, on my bathroom sink, I set up a Liebig condenser to convert marijuana into hash. It worked too!! 1. We Blogged to yesterday about adjusting Señor Tránsito's driver's side door closer. At present, when Tránsito parks at even a slight angle, the driver's door closes on George's leg unless George holds that door open. At Ace Hardware here in the City of Missoula, we purchased a length of 1/2" wide x 1/16" thick aluminum. We plan to attach a 4" long section of this aluminum to the door closer so that the closer will have more pressure on the mechanism. Our thinking is that with more pressure, the closer will now have more resistance to keep the door open. Thus the door will no longer close on George's leg. 2. Scampy's black water drain runs very close to Scampy's underside. When attaching a drain hose to that black water drain, the closeness to the bottom makes it difficult to hook on the drain hose. 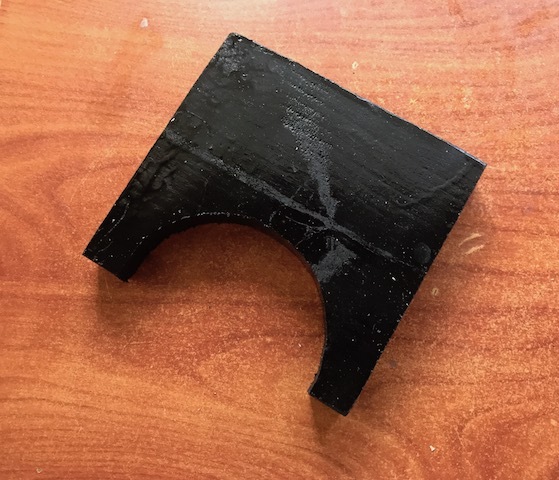 Our plan is to lower the black water drain by inserting a "U" shaped wood block on top of the drain. With the drain now lowered, it should be much easier to attach the drain hose. 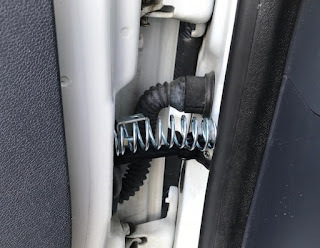 The pic below shows the extension spring that was added to keep Scampy's driver side door from closing on George's leg. Extension spring to prevent door closing too easily. We just completed editing and publishing a movie about Scampy's shim block. Hi George- what happened to your air conditioner project? By the time you get it, you might not need it anymore? Walmart sells small units such as you ordered. Could you cancel the Amazon order, and get one at Walmart? Just hoping that you will get to enjoy air conditioning while the weather is still hot. My air-conditioner has been delivered to my address in Ponderay Idaho. Right now, I am in Missoula Montana. I plan to install my new air-conditioner while it is still summertime.